Entering the ring are the heavyweights in the mortgage loan industry: Bank of America, Chase and Wells Fargo. But rather than pounding each other with boxing gloves, each of these competitors is looking to score a mortgage rate knockout. Which one shall don the golden dollar sign-embellished champion’s belt for the best home loan interest rate? The lights go up, and the bell rings. Let’s get ready to rumble! Here’s the context for our brawl: On June 24, Britain announced the results of its referendum on remaining in the European Union. Mortgage rates had been moving higher on the expectation that the U.K. would stay. But when voters decided to leave, a decision now known as the Brexit, investors rushed to bond markets. Prices soared, yields fell, and as a result, mortgage rates plunged. 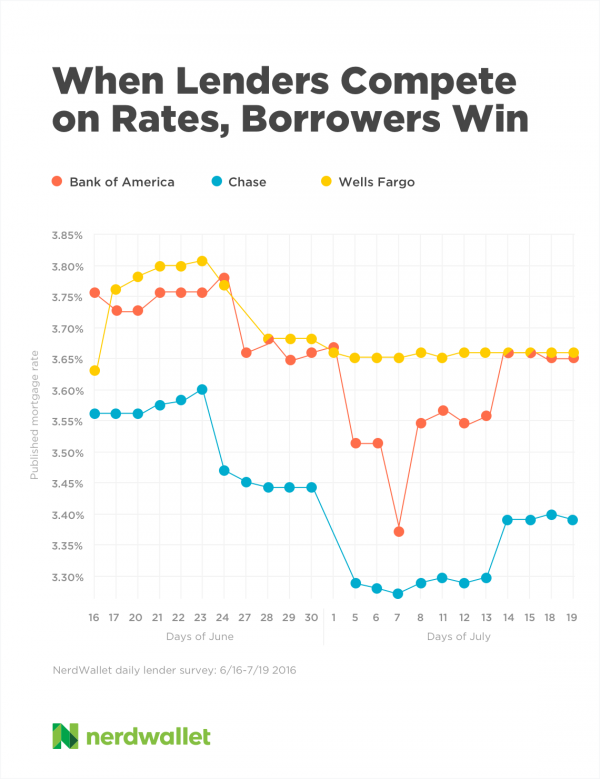 We’ve charted Bank of America’s, Chase’s and Wells Fargo’s published 30-year fixed mortgage rates from a week before the Brexit vote through July 15. All three lenders initially lowered their interest rates about a one-eighth of a point (0.125%). Wells Fargo hung on to that discount for the remainder of our analysis period, while Bank of America and Chase continued to deepen theirs, before taking them back a week or so later and returning to their initial rate cuts. But Chase’s jackknife powerbombed the competition and remained below its two contenders. Grab Chase’s sweaty arm and raise it high. It’s clear that the bank is the low-rate winner. During the analysis period, Chase published an average rate of 3.44%, Bank of America 3.65% and Wells Fargo 3.70%. That’s a hair better than a quarter-point difference between best and worst. Bank of America: $200,000 loan, 20% down payment, discount points up to 1%, 80% loan to value, single-family home in California. Wells Fargo: $200,000 loan, 25% down payment, over $5,000 in estimated closing costs and a 740 credit score. As you can see, each lender’s assumptions vary, so this isn’t exactly an apples-to-apples comparison. But it’s about as close as you can get without giving a lender any information. The only way to get a real-life rate is to apply to multiple lenders and compare their terms as shown on official loan estimates. A 0.26 percentage point difference is more than just a sucker punch when it comes to a $300,000 home loan. A 30-year mortgage at 3.44% (the Chase average rate) saves you $44 per month — and more than $15,700 in interest over the life of the loan — compared with a 3.70% mortgage from Wells Fargo. And according to the Consumer Financial Protection Bureau, shopping multiple lenders is likely to save you even more. Ultimately, that makes you the real winner.